Founded by Nick Syris and Omar Nasir, LH Premium Cigars arose from a line of custom-made Cuban cigars exclusive to Lavida Habana, a chain of high-end retail shops in the Middle East. The idea was to expand distribution to the U.S. market with non-Cuban blends. LH Premium Cigars launched in the U.S. in 2014 with Claro and Maduro lines, and in 2015 debuted the Colorado. Each is crafted at the Tabacos de Costa Rica factory in Costa Rica and was originally offered in three vitolas: Robusto, Toro, and Gordo. Since, Lancero, Petit Gordo, Corona, and Churchill formats have been added to each of the three lines. The Colorado sports an Ecuadorian Habano wrapper, a Nicaraguan binder, and filler tobaccos from Ecuador, Nicaragua, and Peru. It is billed as medium- to full-bodied, and the advertised flavors include oak, fig, maple syrup, vanilla, citrus, cloves, pine, melon, cinnamon. 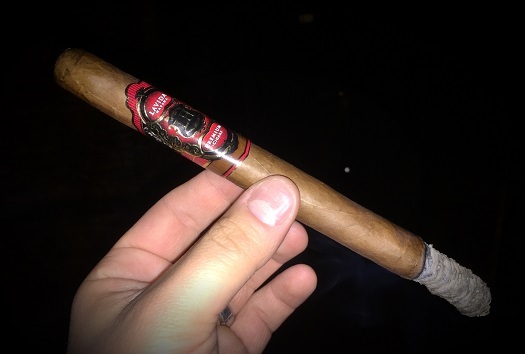 I smoked several LH Colorado Lanceros for this review. This cigar retails for $9.50 and measures 7.5 inches long with a ring gauge of 42. Beneath a band of black, red, and gold is a velvety, clean, reddish wrapper with thin veins. The soft pre-light notes at the closed foot remind me of sweet hay, honey, and graham cracker. Despite the thin ring gauge, the cold draw is clear. At the outset, I’m greeted by a spicy cedar core that’s dry, salty, and fairly aggressive on the palate. Background notes include cayenne heat, cereals, dried fruit, and sunflower seeds. After half an inch, the salt fades a bit as cream, peanut, and honey become more apparent. Still, the driving force is cedar, the effect of which—for least to me—is very frequent sips of water (and, yes, bourbon). The texture is bready. Towards the midway point, the Lancero gains complexity with the addition of some faint floral notes and melon. A bitterness is also present, though it is not a focal point of the profile. The body is squarely medium, and the resting smoke boasts a nice aromatic sweetness. There are no major changes in the final third, save for a slight increase in intensity and heat. Throughout, the combustion qualities leave little to be desired. This is a well-made Lancero with above average smoke production, a fairly stable ash, a smooth draw, and a burn line that—while not perfect—doesn’t really require any touch-ups along the way to stay even. In many respects, I think the Lavida Habana Colorado Lancero delivers an experience that’s classic and Cuban-esque (perhaps not surprising, given the company’s origins) layered with a little more strength and some Nicaraguan zing. On its own, it falls short of exceptional and, to my taste, could benefit from less salty bite; paired with the right libation, though, it can be quite satisfying. All of this adds up to a score of three and a half stogies out of five.